This substantial, 6.4 x 7.0m Garden Room with Veranda was installed as an outdoor entertainment area. As with all our garden buildings, delivery and installation by our specialist team was included. The exterior features sawn weatherboard cladding made from FSC® certified timber and coated in Pebble Valtti paint. The exterior is complemented by grey slate composite tiles on the roof, designed for longevity against extreme weather and UV rays. The interior features painted matchboard wall lining, a heavy-duty floor with natural lacquer, together with an electrical pack with heater. This added insulation will allow our customer to enjoy their Garden Room all year round. 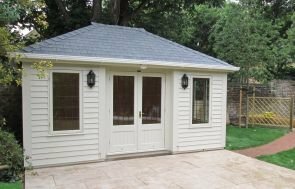 This model is part of our wider range of Garden Rooms, which can be seen on display at our show centre in Sunningdale, Surrey, which has more than 25 different buildings. 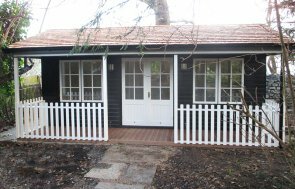 All of our garden rooms are classically elegant and hand-crafed to our exceptional standards. They are designed to provide a luxurious outdoor space to be enjoyed all year round. 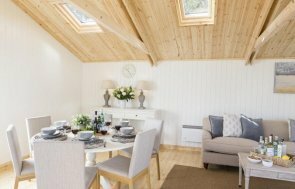 With features such as full insulation, matchboard lining and electrics, you can have an idyllic garden retreat, hobby room or garden office that you can be sure you'll be comfortable in. For a look at our full range of garden rooms, please use the link below.